So, it’s that time of year again. Last year, I was fortunate enough to be involved Coffee Stops Awards, set up by Chris Ward to promote all that’s good about the independent coffee sector in London. This year, the Awards are back, bigger and better than before and now covering the entire UK. Last year I was in the running the Best London Coffee Blog Award, where I eventually finished second behind the winner, Daniel of Cups of London Coffee. This year Daniel and I were back, this time in the expanded category of Best Media for Coffee, where we were up against some seriously stiff competition, including professional publications such as Caffeine Magazine and on-line powerhouses like the Coffee Forums UK. As with last year, there were 10 categories in the awards, each one chosen by popular vote. Voting closed on Wednesday at four o’clock, just hours before the Awards were presented at the Caffè Culture Show. In all, over 60,000 people voted this year, an impressive turn out. Thank you to everyone who voted, especially those who voted for me! You find out who won what and how I got on after the gallery. 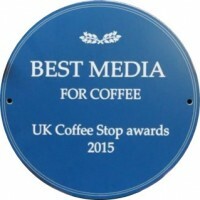 There are ten categories in this, the second Coffee Stops Awards. These are listed below, along with last year’s winners (although remember that the winners last year were for the London, not the UK), and then followed by the top three this year. Last year’s winners, The Wren, clearly couldn’t defend its title, no longer being a new coffee shop, so we were certain to have a new winner! Congratulations to Two Doors Down, from Kentish Town. Two Doors Down celebrates its first birthday in a few weeks! Last year’s winners, Timberyard’s second branch in Covent Garden, had another strong showing this year, but was forced into third place by some stiff competition. Congratulations to 200 Degrees which has been on my radar for some time now. Initially just a roastery, 200 Degrees has recently opened its (now Award-winning) coffee shop. Expect a Coffee Spot visit to Nottingham at some point this summer! Another Award where the defending champion was in the running again this year. However, Harris & Hoole couldn’t quite defending its title, getting pushed into second place. Congratulations to Costa Coffee, who couldn’t send a representative to the Awards (which is why there are no pictures in the gallery). Defending champs, Four Corners, was in with a good chance of retaining its crown after a strong social media campaign, with the campaign slogan “Nag them until they vote. Then nag some more.” (I may, by the way, have made that up…). So, how did Four Corners do? So, congratulations to Four Corners, successfully defending its crown from dark horse Redberry Coffee Co, flying the flag for Northern Irish coffee. Last year’s winners, Artisan in Putney, were pushed out of the top three by one familiar name from last year’s awards and two newcomers. Congratulations to Established Coffee, who sadly couldn’t make it over from Northern Ireland for the Awards (which is why there are no pictures in the gallery). Another Award in which the defending champions were squeezed out of the top three, Best Coffee Shop For Cyclists was a fiercely contested Award, with three new names in the top three. Congratulations to G!ro, which I’ve yet to visit, despite it being just 15 miles from my house! Expect a visit at some point over the summer! The Coolest Baristas Award was another stiffly contested one in which last year’s winner were pushed out of the top three. Congratulations to well-deserved winners, The Gentleman Baristas, who certainly looked the coolest at the Awards! I now have beard envy. And another place I really should visit! This Award was so tightly contested that there’s actually a top four, with defending champions, Square Mile, being pushed down to third place. A real dark horse here as, I must confess, I hadn’t even heard of the winners, Bean Shot Coffee, until the Awards night. Something of an unknown quantity, Bean Shot came from behind to pip Extract at the post in the last few hours of voting! So, I’ve saved the best two Award until last. First of all, there’s the all-important Best Media for Coffee, where I finished second last year before the Best Hair in Coffee, Cups of Coffee London. Another Award that was so tightly contested that there’s actually a top four. So, how did I get on? Congratulations to the winners, Coffee Forums UK, and the lovely Glen Watson, who founded the the site seven years ago. I’m really pleased for him. And gutted to finish just behind Daniel, of Cups of London Coffee. Again. Although, I must say, well done, Dan, but I’ll get you next year. Congratulations to Gary and his team on taking two Awards this year, and well done to Established Coffee and 200 Degrees for such a strong showing, an Award each and a top three in the Best Coffee Shop Award! Nice to see Bean Shot Coffee win the Best Coffee Roasted in Britain. They are very local to me and their coffees are superb. Well done on your third place – onwards and upwards next year. You should, Bruton and the surrounding area are lovely.